Keep close to Nature’s heart…and break clear away once in a while, and climb a mountain or spend a week in the woods. Wash your spirit. 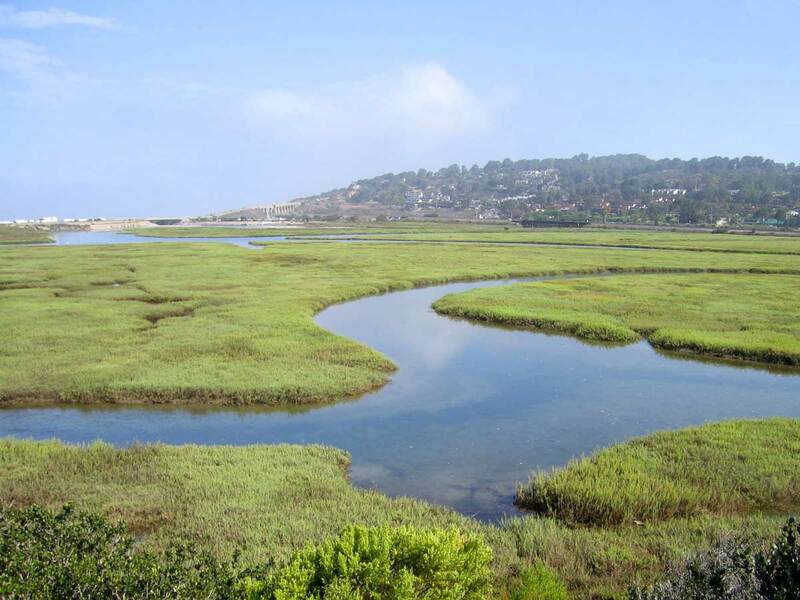 Los Peñasquitos Lagoon is part of the Torrey Pines State Natural Reserve located just south of the City of Del Mar and north of La Jolla Shores. The Lagoon is bounded on the east by Sorrento Valley Road that runs parallel to Interstate 5 just before it merges with Interstate 805 to the south. The Lagoon is bounded on the west by North Torrey Pines Road, which is considered party of historic Highway 101. The North Parking Lot near the ocean inlet and Highway 101. The South Parking Lot and the Marsh Trail (western trailhead). Torrey Pines State Natural Reserve: The Guy Fleming Trail and Torrey Pines Adobe, a visitor’s center and museum. The Sorrento Valley Road Multi-Use Trail/Bike Path. Carmel Valley Road and pathway. Views of Lagoon Inlet and Salt Marsh Habitats. Access to Torrey Pines State Beach. 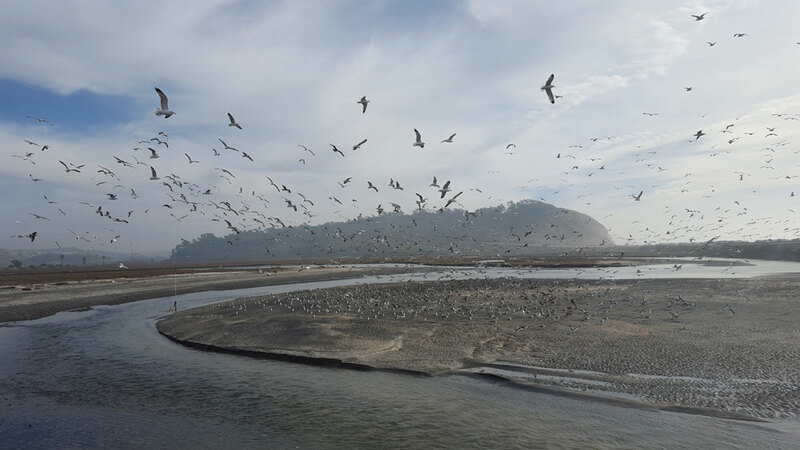 Perhaps the best place to visit the Lagoon’s inlet area and Torrey Pines State Beach is by parking in the North Parking Lot located off McGonigle Rd and Carmel Valley Road (provide or direct to Google Maps link). Amenities in the North Parking Lot include: bathrooms, showers, water fountains and an ADA access to Torrey Pines State Beach and public transit (bus stops). Please note that the North Parking Lot is a “pay for use” parking lot that requires a fee for hourly or daily use unless you have the appropriate annual parking pass issued by State Parks Parking. Your parking receipt works for both the North Parking Lot and South Parking Lot on the same day. Both lots open at sunrise and close at sunset, with no overnight parking allowed. Click on this image for driving directions to the North Parking Lot. Image by Google Earth. The section of Highway 101 that passes by Los Peñasquitos Lagoon and Torrey Pines State Beach is called North Torrey Pines. Currently there are no safe viewpoints of the Lagoon for pedestrians along Highway 101 due to northbound bicycle and vehicular traffic and lack of pedestrian facilities. Since vehicular traffic often occurs in speeds in excess of 60 miles per hour, pedestrian use along the northbound lane of Highway 101 should be avoided due to unsafe conditions. However, it has been acknowledged during public workshops that Highway 101 provides an exceptionally unique view of the Lagoon and its wildlife. 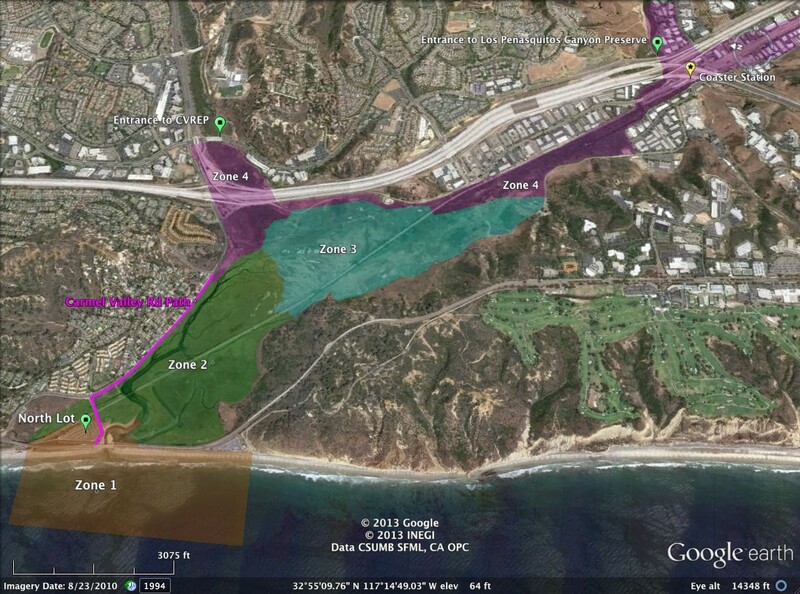 Therefore, improvements for public access and safety were considered and documented in the draft Los Peñasquitos Lagoon Enhancement Plan. Click here to see and download the draft enhancement plan. 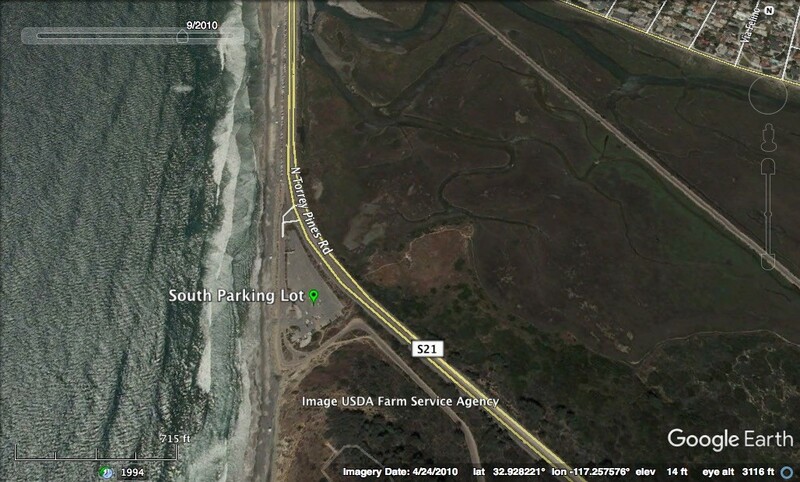 View of Highway 101 (N. Torrey Pines Rd) and parking lots. Graphic adapted by Google Earth. Please do not pass beyond the roped fencing, as this area is used by the federally listed western snowy plover and contains fragile dune plants that can be easily trampled, such as the Nutall’s Lotus (Acmispon prostratus) that is considered rare, threatened or endangered in California by the California Native Plant Society. This area is also used by Belding’s savannah sparrow that nest in the nearby pickleweed and forages along the dune and sand bars within the inlet area. Rattlesnakes have also been observed in the shrubs adjacent to the fence line at the North Parking Lot. Access to the Marsh Trail’s western trailhead. 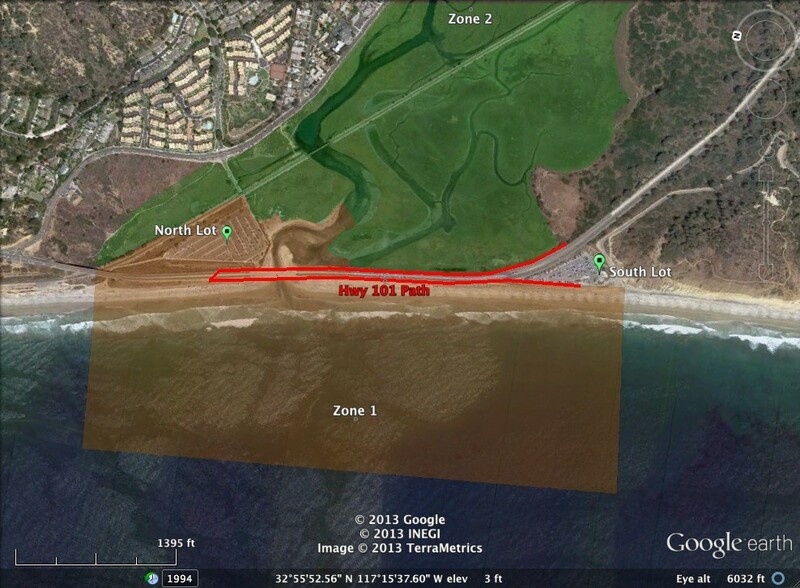 Located just off North Torrey Pines Road (Highway 101), the South Parking Lot also provide access to Los Peñasquitos Lagoon through the Marsh Trail’s western trailhead, though access is currently limited due to the lack of safe pedestrian facilities (e.g. crosswalk, tunnel, etc.). Access to south Torrey Pines State Beach and the Torrey Pines State Natural Reserve is also available from the South Parking Lot. Amenities in the South Parking Lot include: bathrooms, showers, water fountains and access to Torrey Pines State Beach. Please note that the South Parking Lot is a “pay for use” parking lot that requires a fee for hourly or daily use unless you have the appropriate annual parking pass issued by State Parks Parking. Your parking receipt works for both the North Lot and South Lot on the same day. Both lots open at sunrise and close at sunset, with no overnight parking allowed. Click on this image for driving directions to the South Parking Lot. Image by Google Earth. 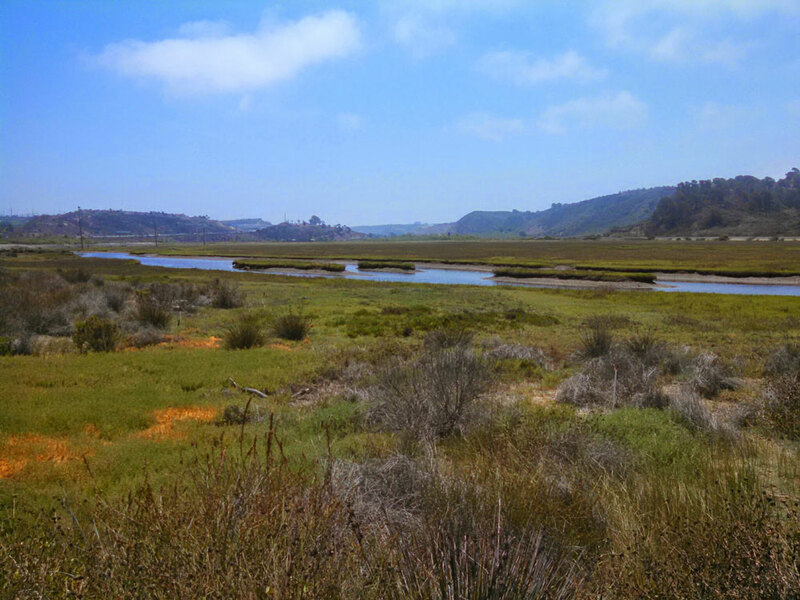 Located along the southern edge of Los Peñasquitos Lagoon, the Marsh Trail connects Sorrento Valley with the South Parking Lot at the Torrey Pines State Natural Reserve and is the only dedicated trail by State Parks within the Lagoon. The Marsh Trail provides a rustic and often intimate trail experience that provides the user with an up-close view of the Lagoon and its wildlife. With segments often submerged under water during higher high tides, the Marsh Trail can present certain challenges to the trail user. That being said, response during public workshops indicated that a majority of people prefer to keep the Marsh Trail in a similar condition without major improvements (e.g. paved walkways) aside from improved access at the western trailhead at Highway 101. The Marsh Trail can be accessed from either its western trailhead or from its eastern trailhead. If accessing the trail from the west, parking is available along the southbound lanes of Highway 101 (referred to as North Torrey Pines Road) or in the South Parking Lot at Torrey Pines State Natural Reserve, which involves a parking fee or annual parking pass from State Parks. Please be aware that accessing the trailhead form this end can be dangerous for pedestrians since you must cross Highway 101 without a dedicated crosswalk or traffic light and vehicles often travel 60 mph. The eastern trailhead provides a much safer access point to the Marsh Trial. Parking is available along Flintkote Road prior to the gated entrance that denotes the boundary line of the Reserve. Continue walking along Flintkote Road, past the ranger’s residence until you reach a second gate that marks the trailhead for the Marsh Trail. Trail users should be aware that they may be exposed to ticks and mosquitos that may carry West Nile Virus during months when this virus is most frequently found within the vector population (Late Spring – Summer). Click here for more information about how you can protect yourself from airborne vectors. 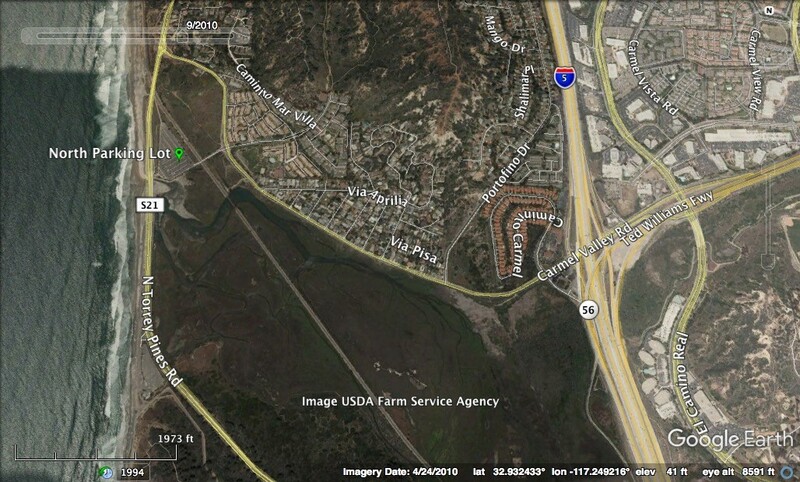 Marsh trail location and alignment in Los Peñasquitos Lagoon. Graphic adapted from Google Earth. Above the South Parking Lot is the main portion of the Torrey Pines State Natural Reserve. The Reserve is home to a relic forest of the Torrey Pine (Pinus torreyana), the rarest pine tree in North America. 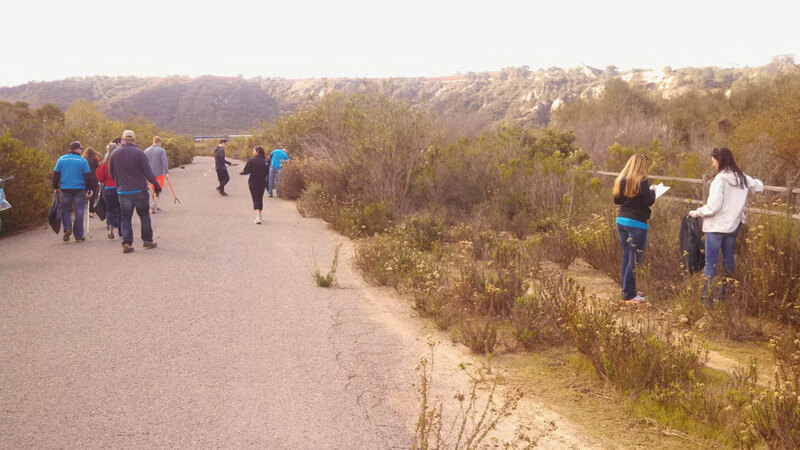 The Reserve has an extensive trail network that includes the ADA accessible Guy Fleming Trail, which provide amazing views of the coastline toward La Jolla to the south and Del Mar to the North, along with views of Torrey Pines State Beach and Los Peñasquitos Lagoon. Located at the top of Torrey Pines Park Road within the main section of the Torrey Pines Natural State Reserve, the Torrey Pines Adobe houses a visitor center, a small interpretive museum and offices for State Parks staff that includes its rangers. Behind the Adobe are some amazing viewpoints of Los Peñasquitos Lagoon and Torrey Pines State Beach, looking north toward the City of Del Mar. Trail maps of the Reserve can also be found at the Adobe, as well as park information provided by the Torrey Pines Docents and panels. The entrance to the Torrey Pines State Natural Reserve is located at the South Parking Lot off of North Torrey Pines Road (also referred to as Highway 101). The entrance is open to southbound lanes and from a left turn lane for northbound traffic, though it can be closed during peak use (e.g. weekends). Parking is available in the South Parking Lot or at the top of Torrey Pines Park Road. A daily use parking fee or annual pass is required and “drop offs” are not allowed. Click here to view Torrey Pines State Natural Reserve Trail Map. 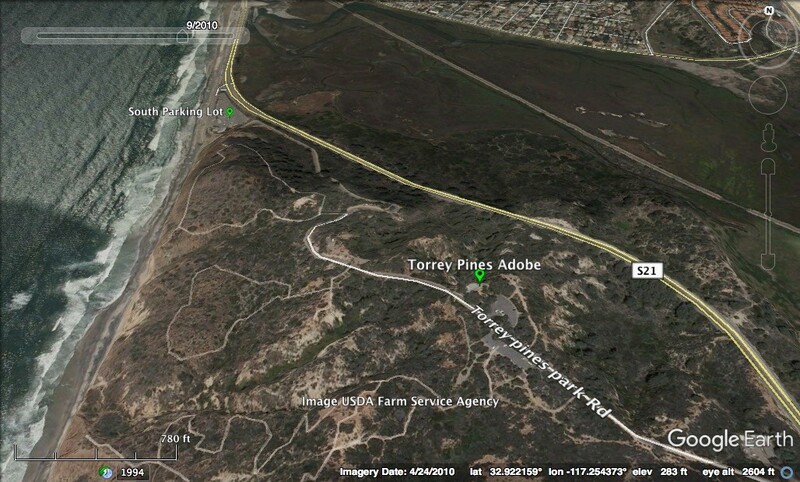 Click on this image for driving directions to the Torrey Pines Adobe. Image by Google Earth. Access to the Sorrento Valley Road Multi-Use Trail (Northern Trailhead). Located off Carmel Valley Road just west of where State Route 56 and Interstate 5 meet, the Sorrento Valley Park and Ride is a great place to park if you want to explore the upland habitats of Los Peñasquitos Lagoon along the closed section of Sorrento Valley Road that is a dedicated multi-use trail. Click on this image for driving directions to the Sorrento Valley Park and Ride. Image by Google Earth. In 1996, the northernmost section of Sorrento Valley Road that borders Los Peñasquitos Lagoon was closed to vehicular traffic between Carmel Valley and Carmel Mountain Road for the construction of Pump Station 65 and remained closed during the widening of Interstate 5 and Interstate 805 merge. In 2003, the San Diego City Council voted to permanently closed this section of Sorrento Valley Road following input from local community members and environmental groups, as well as State Parks and LPLF. Now a dedicated multi-use trail and bike path within the City of San Diego’s easement, Sorrento Valley Road provides unique views of Los Peñasquitos Lagoon and its wildlife while also providing bicycle access between Carmel Valley Road and Sorrento Valley. The Sorrento Valley Road Multi-Use Trail/Bike Path can be accessed from its northern or southern trailhead. Parking at the northern end is available at a Caltrans Park and Ride or along the street up to the gated entrance. Parking on the southern end is available along the street just north of Carmel Mountain Road. The current state of the Sorrento Valley Road Multi-Use Trail/Bike Path is fairly degraded as no improvements have been implemented other than patching the existing asphalt that previously served as the roadway. Working with local stakeholder that include members of the public, LPLF explored opportunities and constraints for improving this City-owned trail segment that include providing a separate soft surface trail that parallels the paved path to separate bicycle traffic and maintenance vehicles from pedestrian facilities (e.g. viewpoints). Additional improvements proposed for the Sorrento Valley Road Multi-Use Trail/Bike Path include modifications to existing storm water facilities to reduce trash and debris loading to the Lagoon; replacing existing chain link fencing and gates with a more formal trail head, informational kiosks, and elevated decks to improve view corridors. 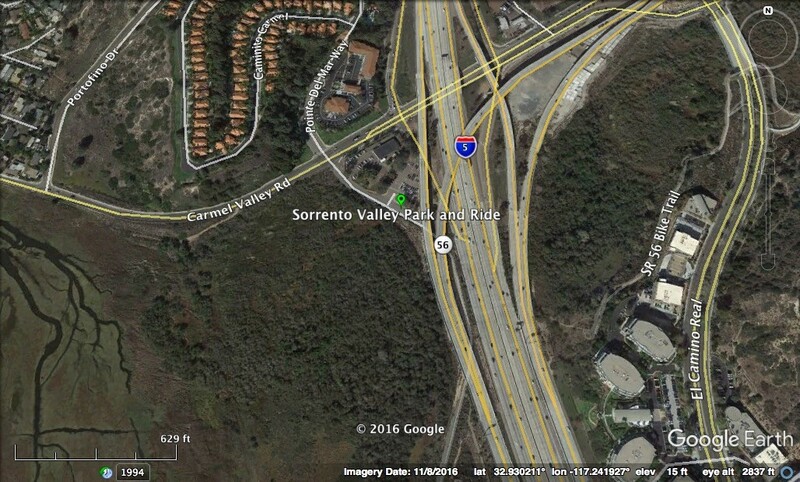 Comments and recommendations from stakeholder workshops lead by LPLF have been provided to the City of San Diego, Caltrans, and SANDAG whom have already prepared conceptual renderings of proposed improvements to this closed section of Sorrento Valley Road. Please refer to Chapter 8 of the recently updated Lagoon Enhancement Plan for more information and graphics of proposed improvements. Trail users should be aware that they may be exposed to mosquitos that may carry West Nile Virus during months when this virus is most frequently found within the vector population (Late Spring – Summer). Click here for more information about how you can protect yourself from airborne vectors. 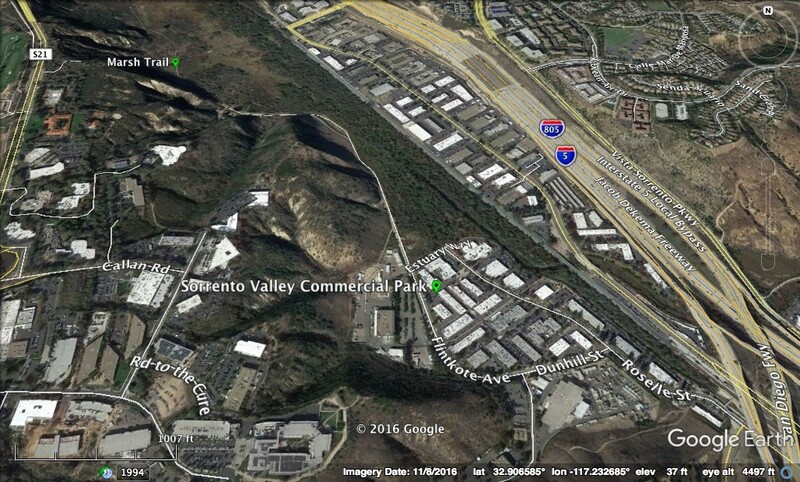 Sorrento Valley Road Multi-Use Trail location and alignment in Los Peñasquitos Lagoon. Graphic adapted from Google Earth. Bordering the northern edge of Los Peñasquitos Lagoon is Carmel Valley Road. While there does not exist a dedicated trail along this roadway, the City of San Diego maintains a dirt pathway within their right of way that extends about 3 feet off the curb line toward the Lagoon. Similar to the North Lot, Carmel Valley Road provides views of the iconic Torrey Pines Headland while also giving an up-close view of the Lagoon northern channel that extends eastward to Carmel Valley as well as views toward Sorrento Valley. Carmel Valley Road can be accessed from the west by Highway 101 or from the east via an exit off Interstate 5 or continuing westward on State Route 56. Limited parking is available along the roadway. During stakeholder workshops, three opportunities to improve public access to Los Peñasquitos Lagoon along Carmel Valley Road were identified: Closing user generated trails between the North Parking lot and Highway 101; pedestrian improvements along the western edge of Carmel Valley Road between McGonigle Road and Sorrento Valley Road; and providing improved safety for bicyclists with emphasis along the segment between Portofino Drive and Sorrento Valley Road. Please refer to Chapter 8 of the recently updated Lagoon Enhancement Plan for more information and graphics of proposed improvements. Pedestrian access along Carmel Valley Road is somewhat limited and constrained to the dirt path maintained by the City of San Diego. While there is a dedicated bicycle lane for most of the length of Carmel Valley Road, there does not exist a dedicated bike lane between Portofino and Sorrento Valley Road that requires bicyclists to share the roadway with vehicles. Access to the Marsh Trail (Eastern Trailhead). Access to the Marsh Trail can also be found at its eastern trailhead located in the Sorrento Valley Commercial Park. Street parking is available along surface streets where Flintkote Avenue meets Estuary Way. To reach the Marsh Trail, head north on Flintkote Road north where it enters the Reserve and continue past the State Parks residence to the start of the Marsh Trail. Click on this image for driving directions to the Sorrento Valley Commercial Park. Image by Google Earth.